fw butterscotch & fa caramel pair with tpa brown sugar to deliver the incredible dark note. flv vanilla custard & inw custard are soul mates. 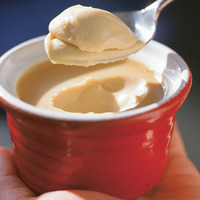 the two combine to deliver a nice thick and creamy, eggy, thick mouthfeel custard. fa almond is the finishing enhancing touch. it adds yet more creaminess and emulsifies all the notes. This recipe is the property of gravi-tea and released under the CC Attribution-ShareAlike 4.0 license. You may not copy, derive or commercialize this recipe without following the terms of this license or the explicit permission of the creator.